jwc has been selected through public tender to provide further consultancy services to Shenzhen Zhaohua International Exhibition Co., Ltd., for a new venue in Shenzhen, Shenzhen World Exhibition and Conference Center (SWECC). The tender was issued by investors, CMSK and OCT, after the project has been transferred from the Government of Shenzhen to the investors of the new venue. 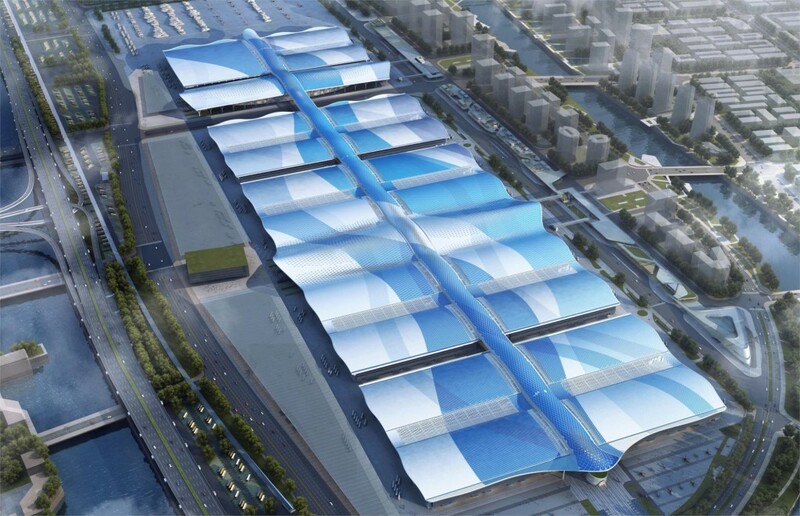 Located in Shenzhen Airport New Town, in the heart of the Pearl River Delta and Guangdong Free Trade Zone, the new exhibition venue is set to become the largest exhibition venue in the world. By its completion, it will offer 500,000m² of indoor exhibition and conference space. Phase 1 of construction will result in 400,000m² of exhibition space consisting of 16 standard halls of 20,000m² each and 80,000m² convention and event space with one multi-functional hall of 50,000m². Phase 1 is expected to be complete and operational in 2019. After having provided advice to the Government of Shenzhen for more than a year, jwc has been awarded a new contract to extend its remit for a further 2 years. Going forward, jwc will be working directly for the investors of this project. Additional sphere of activities cover the full range of the facility and exhibition operations ramp up. To name a few, jwc will support the investors in further developing the architectural design, the selection of venue facilities and equipment as well as in the areas of logistics, transportation and signage. Assistance in the set up and build out of the management model and organizational structures for the venue operation as well as the marketing and sales of the venue are all part of the expanded scope of advisory services. While Turkey’s tourism and exhibiton sector are currently suffering from the recent terror attacks, other countries like Spain and Brazil show signs of recovery from weak performances in the past years. jwc has again examined the state of the global exhibiton industry and summarized the highlights in the ExhibitonWorld magazine. As the trade fair business is a complex one, market shares are difficult to determine. Jochen Witt and Eyal Knoll of jwc discuss the pitfalls of rankings in the trade fair industry. After 2016 has been an exciting and successful year for the trade fair business, jwc looks back and gives an outlook about what 2017 will bring. jwc recently conducted a study in support of the 83rd UFI Global Congress in Shanghai (November 2016). It was based on a survey in which we probed the leaders in our industry, to tell us what are the most likely changes they think might come our way as part of the digital transformation our industry is undergoing. Key findings and highlights from the survey results are discussed in a white paper, titled “Digital Transformation in the Trade Fair Business”. In addition to the survey results, a few ideas with regards to the implications of these results are considered. For example, some of the areas covered are the objectives assigned to the digital strategy of the various organizations, if and how they are measured, and how much progress has already been achieved in various regions. Of course, you will also find jwc’s views on ‘digital’ and whether the trade fair business is going to be overwhelmed by its own version of the next Uber or Airbnb; in other words, what in our view are the real threats vs. opportunities to the trade fair business when it comes to ‘digital’.